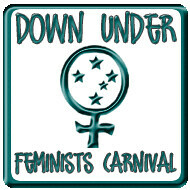 This monthly carnival, with submissions hosted at blogcarnival.com, is open to all feminist bloggers in Australia and New Zealand. Showcase your own posts or those of others. As the carnival’s open to all ANZ bloggers, I’d be awfully surprised if Lauredhel wasn’t hoping for some NZ volunteers for hosting at some point. The more the merrier, eh? Ah do hosts have to be based in Australia? Typo, sorry. Kiwis are of course welcome to host. And as you can see from the widget, In A Strange Land is hosting the next edition! I’d be keen to host at The Hand Mirror in July or August if you need someone. Greetings and salutations! I am very interested in posting some stuff next month, being a feminist writer who lacks an audience since I’m surrounded by fools… but I am new to the blog thing. I have some really important things to say but I would like a bit of info as to how I should go about this.. if someone could e-mail me and give me the rundown it would be greatly appreciated. Do you mean you’re not sure about how to submit a post to the carnival? All you need to do is post it to your own blog, copy the URL (it needs to be a directly link or “permalink” to the post), and plug it into the Blog Carnival submission form with the other info. A brief precis, bio, or pull-quote in the “Remarks” section is useful. Are there many feminist bloggers on Myspace? I confess, it’s a space I consciously avoid. I understand why you would consciously and conscientiously avoid myspace – it’s not neccesarily a haven of feminist thought but it was the easiest way for me to voice my own opinions online. Back in the day (98) I had websites of my own but dropped out of the loop and when I returned the whole system had been appropriated by sites like myspace and blogs and the free web hosting seemed to be a thing of the past so I decided I’d use myspace as a base for blogging. I’m not exactly a technobimbo, I am just really busy and have limited web access. Myspace is awfully convenient. I daresay there’s at least half a dozen feminists on myspace.. you never know eh? The main problem with MySpace for blogging is that MySpace is designed around graphic elements, whereas blogging needs a site that is designed around text. The text elements on MySpace are difficult to read and at the moment every blog entry title seems to get shown in triplicate. The MySpace experience actively discourages people who want to read text. (That’s why I only ever go to MySpace to check out gig guides for musos and comedians, and it really annoys me if the gig guide isn’t at the top of their page). LiveJournal, Blogger and WordPress are all really easy free blogging platforms to use. LiveJournal allows bloggers to form communities around special interests as part of the platform (in the same way as MySpace groups), and the feminist communities there are already very strong, so if the social networking is what appeals to you LJ might be the best fit. People who aren’t into the social networking so much often prefer to choose Blogger or WordPress as their platforms (and Typepad and Movable Type are still hanging in there, plus some other newer startups) but the big thing for all of them is that when you come to the site the main element is the text.